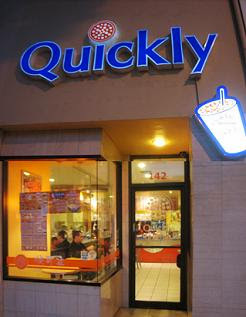 After dinner tonight, we walked by the Quickly Tea place that use to Q-Cup. Whenever I want a milk tea in or near SF the place I see most is Quickly Tea. I have only ran into 1 Tapioca Express. In SoCal they are everywhere. It looks almost exactly like TE. The location in San Mateo that I went to today did not have a Grand Opening deal so it was normal price. I paid $2.15 for my Jasmine Milk Tea and it was good. It was better than I thought it would be. Last time I had it after Burma Superstar, it was only decent but the great price makes up for it! ^_- Even for $2.15 that's fine, I liked the drink and had it made my way.